The fate of the North Sea’s grounded Super Puma helicopter fleet could ultimately be decided by factors like public confidence not just safety assurances, a union chief today claimed. The warning comes after key offshore and aviation industry players gathered behind closed doors to hear the latest about an investigation into a deadly crash in Norway that killed 13. A potential return to service of the controversial choppers was discussed as part of the meeting with manufacturer Airbus. The aircraft have been under heavy public scrutiny for their involvement in a number of fatal accidents over the last decade. The meeting was led by the Offshore Helicopter Safety Leadership Group (OHSLG), which is made up of representatives from the UK Civil Aviation Authority, helicopter operators, the oil and gas industry and trade unions. The Norwegian aviation safety watchdog and the pan-European safety group EASA also attended at the Jury’s Inn in Dyce at the end of last month to hear from Airbus. But it was confirmed last night that the aircraft will not return to service in the North Sea until given regulatory approval by both the UK and the Norwegian aviation watchdogs. However, RMT regional organiser Jake Molloy said the return of the aircraft would hinge on “other factors” than an Airbus recommendation. He said: “We just made our position clear that we have got to wait for the investigation to be completed before we consider the return to service. “Everybody agreed that this was the case anyway. The CAA and the Norwegian CAA has not and will not change until the conclusion of the investigation, which is at the end of April. “Airbus showed us a lot of stuff that they are doing but whether that returns the aircraft to service or not is not for Airbus to decide – it is for the regulators, the oil industry and the workers to decide. “Airbus naturally is a company that produces innovative improvements in technology and flight safety and they are to be welcomed. The Airbus aircraft have been grounded since a fatal crash off Norway last April killed all 13 people on board including Iain Stuart 41, from Laurencekirk, Aberdeenshire. In the wake of the tragedy off Turoey, the European Aviation Safety Agency (EASA) stopped flights for both the model involved, the H225, and its sister chopper the AS332 L2. Although the flight ban was lifted back in October, aviation regulators in the UK and Norway decided to maintain the grounding until a full investigation into the cause of the Norway accident was completed. This has meant the main North Sea helicopter operators had to find alternate aircraft, with the majority of flights out of Aberdeen now being carried out in Sikorsky S92s. And last night it was confirmed that no Super Pumas will fly in the North Sea until at least the end of April, when a report into the Norway crash is due. A spokesperson for the UK Civil Aviation Authority, said: “The safety of those who travel on offshore helicopter flights is a key priority for both the UK and Norwegian aviation authorities. 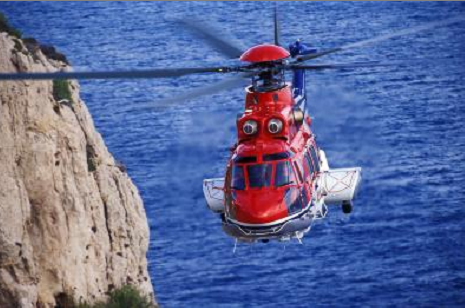 “The UK and Norwegian authorities have confirmed that existing restrictions, preventing commercial use of the H225LP and AS332L2 Super Puma helicopters in the two countries, remains in place. “At a meeting in Aberdeen on February 28, workforce representatives, helicopter operators and the offshore industry were updated by Airbus Helicopters and the European Aviation Safety Agency on the progress that has been made on developing significant changes and inspections to the helicopter type that could, in the future, allow the UK and Norwegian authorities to lift restrictions. “Significant information from the investigation of the tragic 2016 Norwegian accident is now available and we await further information. Any decision will be made only after extensive consultation, investigation and consideration. An Airbus spokesman confirmed that the French manufacturer was also in attendance at the meeting. He said: “Airbus Helicopters took part in an OHSLG meeting on Tuesday 28th February by invitation of the CAA, which included EASA, Norwegian CAA, workforce representatives, helicopter operators and wider offshore industry. At the meeting Airbus Helicopters provided an update on the progress made in relation to the LN-OJF investigation. Step Change in Safety Executive Director Les Linklater was also at the meeting. He said: “All members were given a presentation by Airbus Helicopters providing an update on the progress made on the LN-OJF [Norway] investigation. “The meeting was a transparent, informative and focused session to discuss advances being made into raising standards in flight safety. “As the investigation into the April 29, 2016, helicopter crash in Norway is still ongoing, we will continue to be informed by its findings. However, what we need to remember is that when we discuss helicopter safety our focus is, and will continue to be, on the people flying in them, passengers and crew.